I’m on a bit of a food kick lately, so if you’ll indulge me, today I feel like talking about cheese yet again. I’ll be back to painting something soon I assure you, but today I need to talk about one of the most important things in my life and that is cheese. Not just any cheese, or your ordinary mass produced American chunks of cheddar, no I’m talking about the cheeses that come from the artisans. Gather round friends, because I’m about to share with you the secrets to serving a perfect cheese course. A cheese course is a great way to start a party, but whether you serve a cheese course before or after a meal is up to you. It’s an American custom to serve before, and European tradition to serve after the main course. 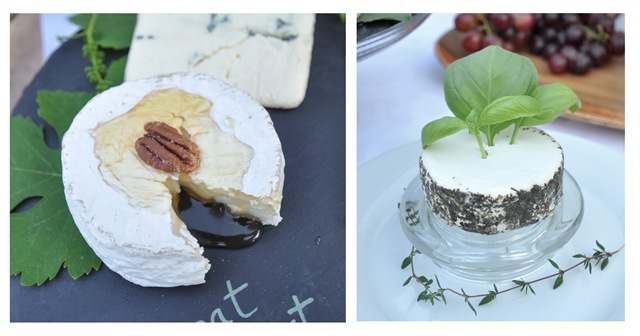 To make your cheese course a memorable one, follow these simple tips! Choosing the Cheeses. Create a balanced presentation by choosing a range of cheeses in a variety of flavors, textures, and milk sources (cow, goat and sheep). Artisan cheeses come in wedges, logs, or rounds, and you’ll find variety in shapes at your local market or specialty store. Choose something mild like a jack or cheddar, something in the middle, like a rind cheese (Brie or Camembert) or a goat variety, and something more pungent or intense in flavor like blue cheese (including Roquefort, Stilton, or Gorgonzola). Don’t serve too many. A palate is overwhelmed with more than four, so choosing three to four cheeses is ideal, plus it will give the taster a variety of choices for comparison and appreciation. Always serve your cheeses at room temperature, and be sure to remove them from the refrigerator an hour before serving. Displaying the Cheeses. 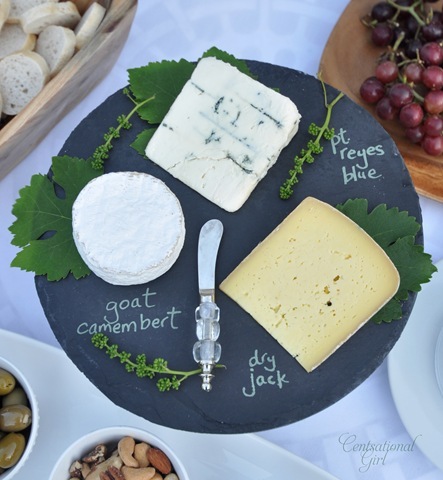 It’s helpful to label your cheeses so guests know what they’re nibbling, and it also keeps them from asking “What was this cheese again?” I use my trusty slate cheese board, and chalkboard markers for labeling. However, if you don’t have a board or cheese markers, simply place the cheese’s label on your serving plate next to the cheese. That is the easiest way for both you and guests to remember, and also make a note for future purchase if it becomes a favorite. 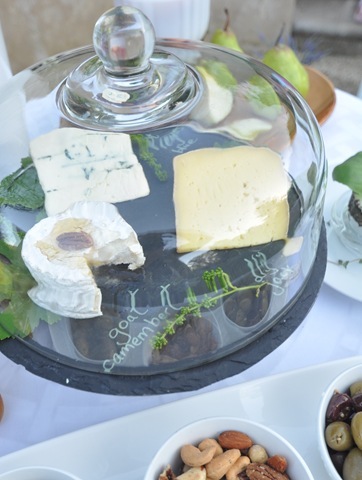 If serving outdoors over a period of time, it’s a good idea to have a dome to protect your cheese from insects or the elements. I just use my cake plate dome or a cloche. Good Company Required! Cheeses pair perfectly with fresh or dried fruits, many desserts, and of course wine. I think it’s so important to balance the soft and savory texture of cheese with ripe fruit. 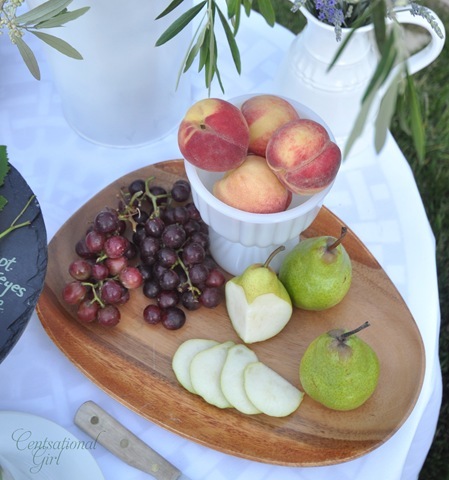 Pears and grapes always work, or you can choose something in season like peaches or apricots. Bread, nuts and olives are also a natural accompaniment. When presenting them, keep it simple! Plain white plates or rustic platters are all you need, just a basket or bowl for your crackers, and a spot for your salty extras. Use whatever you’ve got in your collection, and simply group them together. Let the food shine, no need for extravagance. The best way for guests to sample the cheeses is on a fresh sliced baguette, however I also like to supply simple water crackers for those who want to taste and don’t want to fill up on bread too quickly. Dress Them Up. Don’t be afraid to get creative and add a little something extra to complement or enhance your cheeses, like fresh herbs, honey or chutney on top. When you combine the sweetness of fruit with the saltiness from olives and nuts, you’ll appreciate the savory goodness of different artisan cheeses even more. Fruit: apples, pears, figs, apricots, cherries, berries, grapes, sweet mandarin oranges, ripe or sundried tomatoes and fruit chutneys. Dried fruits work as well as fresh. Nuts: salted or blanched almonds, walnuts, pecans, pistachios. Desserts: fruit tarts or galettes are fantastic when served with a good cheese, which makes the case for serving your cheese course with or as dessert. Wine: There are many opinions on what kind of wine to serve with cheeses. We’ve served just about all of them from sparkling to white to red with an assortment of cheeses. Fresher or softer cheeses typically go well with whites like Sauvignon Blanc or Reisling, rind cheeses pair nicely with medium bodied Syrah, Pinot or Chardonnay, and aged or pungent cheeses favor denser reds like Cabernet, or even dessert wines. If you’re featuring a complex cheese, choose a simpler wine, and vice versa. Don’t worry about always choosing the perfect cheese every time since making your selections is part of the food experience. Experiment with new textures, flavors and varieties! In the end, when you gather together a balanced medley of cheeses, fruits, and nuts, you’re bound to satisfy both your palate and your guests as well. Throw a Less Stressful Holiday Party! I love it! 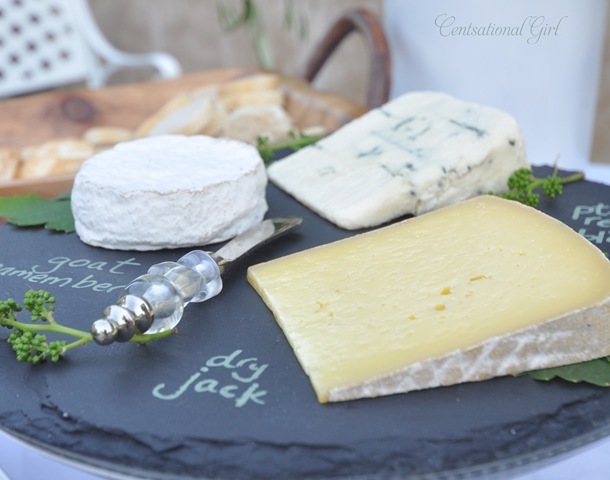 I hadn’t thought about writing the names of the cheeses on the actual slate, great idea! Thank you! I really enjoyed this article. I love artisan cheeses and often get the cheese platter at restaurants but have never served them to guests, probably because I don’t know much about them. I think it’s an easy, elegant appetizer that doesn’t require cooking. …..It’s 5 o’clock somewhere! I’m in. Great post! 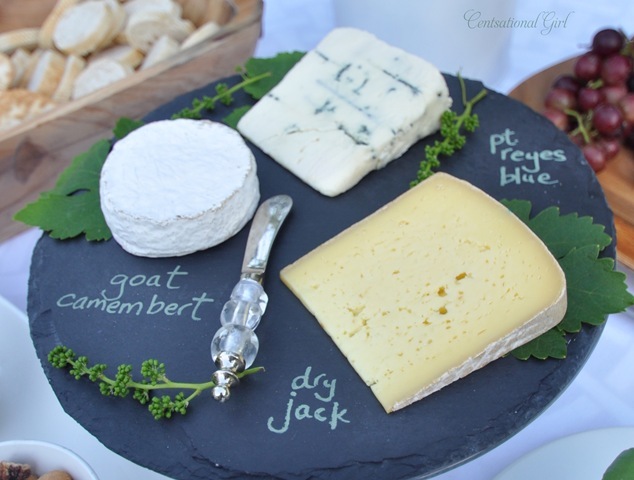 Love the idea of writing the names of the cheeses for your guests. Such a simple, but useful tip! Thanks for sharing. This was a great post!! 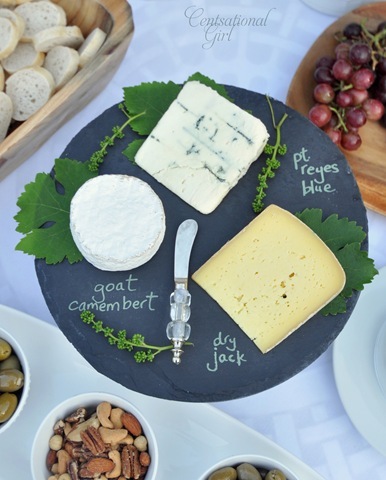 Love the slate platter that you can write the name of the cheeses on. And Thanks for all the great ideas. This is AWESOME information, thanks for sharing, marking for future reference! I want to come to your house, CG! Thanks for all of the info all in one place. 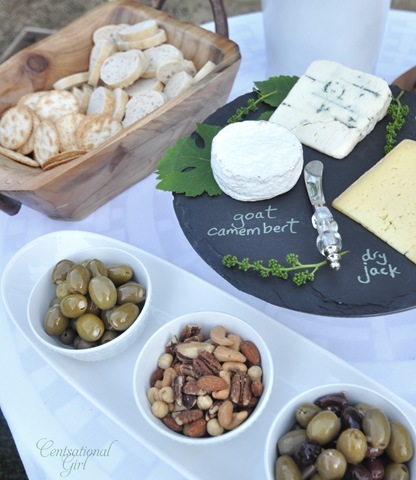 The slate platter is a great idea. I actually have a slate I’ve been figuring out what to do with and maybe I’ll make it into a cheese plate! Great idea. Okay, LOVE the cheese cheer — pure poetry! Also love the simple, beautiful, organic way you’ve displayed everything. (The wooden trug holding the bread provides such a great contrast.) Question — I’m a cheese dunce, so what is the round with the basil leaf garnish and herbs around the sides? Is that butter? Or another type of soft cheese? I have yet to have a nice cheese social. WOW!!! I absolutely love love love cheese. Can soomeone tell me why I automatically thought of wine just from the 1st couple of pics…LOL Yep and it’s only 9ish AM! Great article I will be trying this!!! It’s 8:30 in the morning and you’re got my mouth watering for a cheese platter! I have some Drunken Goat cheese (house favorite) in the frige at home… lunch time snack it is! I’m a cheese junkie, too. I once was at a party where banana peppers were served with a hard cheese and it was surprisingly delicious. Do you have any thoughts on what cheese would work with the peppers? I’ve tried a few and can’t figure it out. I can tell that this is going to be a go-to post for me. I love cheese, but haven’t had much “practice” with it b/c my husband hates cheese. (I realize that this could be a deal breaker for many wives, but I keep him around because he is handy.) ;) Thank you so much for sharing your lovely spread with us. I found this to be very helpful! Last year, me and my friends here in our neighborhood used to have a cheese party – just for fun. It’s the first time I knew that there is a type of cheese that taste good when it’s full of mold or fungus or something. But my favorite cheese at that party was the Gouda. Ohhh it taste like heaven – it better be coz it cost five times more than the ordinary cheese. And it’s imported from the Netherlands, so it’s very rare here in the United States. What a beautiful display! Thanks for sharing your tips! Wow, looks like pure perfection!!! Oh my gosh, this looks so yummy! I love cheese!! My little tip: try Brie with a little apricot jam & walnuts melted in the oven, yum yum yum! Just perfect. I am a cheese of any kind lover. GAH – I love cheese so much. OMG! You have no idea how much of a gourmet cheese addict I am despite not knowing much about presenting/serving them! Thanks so much for the awesome little tutorial! :) Can’t wait to get my “cheese” on! YUP, I’m cheezy like that! A similar slate “drawing” stone for cheese was selling for L35 (about $50) at Harvey Nichol’s in London – nicely done… after envying it there, I use a slate tile from the local discounter to do the same. Yum!! I thought cheese cubes and lays potato chips were a great combo! :) This looks AWESOME. Will definitely have to try! Great post! I’m inspired to have a party just to have a cheese course. MMMM. hahaha this is awesome. I am a cheese freak. It reminds me of the cheese we had that night at that restaurant Shaunna’s brother took us to in Nashville. LOVE. MMMMMMM. Looks divine! I may have to plan my own little wine and cheese gathering soon. 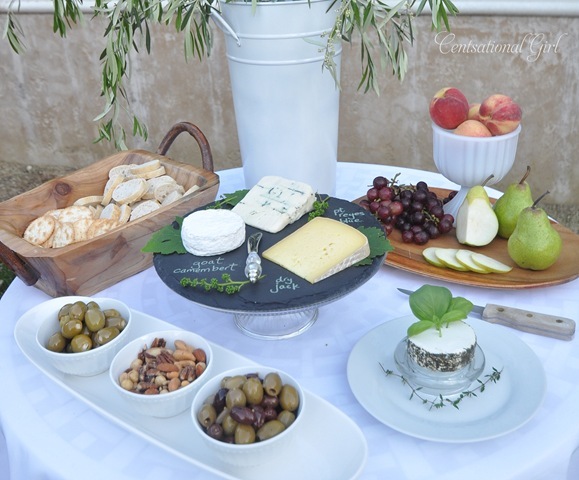 hi Kate – fabulous post, great photos and i love love love your slate cheeseboard!! *** What P*E*R*F*E*C*T TIMING!!! We’re having two new couples over for drinks on Thursday!!! …It’s their first time here, so we’re making it “desert casual”, as we’ve done & enjoyed many times before. I had basically planned cheeses w/ bread n’ crackers & fruits n’ nuts quite similar to your suggestions & actually a “charming & simple” setting out by the pool, too! (If it’s NOT too hot here at 5:30! )… Sooooo, naturally, I ENJOYED this particular posting!!! Love this post! I need a slate too!!! Love it, I guess you saw where I just served regular old cheddar for my husband’s birthday (just kidding). This looks beautiful and tasty! Love the idea for entertaining! J’aime le fromage! I love your slate cheese plate – how fantastic! Great post! OH MY.. That is Sooo mouthwatering! I’m 23wks preggers & can’t eat all the yummy soft cheeses at the moment! :-( But I DO love the chalk platter! We are planning a “wine & cheese under the stars” this summer and I was considering adding to the invite, “bring your favorite vintage and cheese to share”. This will not only keep the cost down, but add a great variety. Is it rude to ask invitees to bring both?